Today was the day of the West Suburban Humane Society's annual Barkapalooza. This is always my favorite event of the year. The 2007 Barkapalooza was the first event we ever attended as an organization and each year it seems to get bigger and better. It was cold though - we all were wearing sweatshirts and hoodies - and I saw some people with gloves. I never put mine on, but I was glad I had them with me. Tammy and I and super-volunteer Terri manned our booth today. I stationed myself in front of the booth, next to the dog walk path, passing out treats to both dogs and humans (Milk-bones for the dogs and Tootsie-rolls for the kids). Lots and lots and lots and lots of dogs today (and one cat on a leash at the very end of the day's festivities). We had a lot of people stop by and say hello - we really are becoming well known in DuPage County. We met lots of new people today, including someone from the city council of a town where there has been some heartburn about TNR - we're very hopeful that this contact will bear some fruit, especially as she was VERY supportive of TNR. Photos I took of the event are now up on our Flickr album. 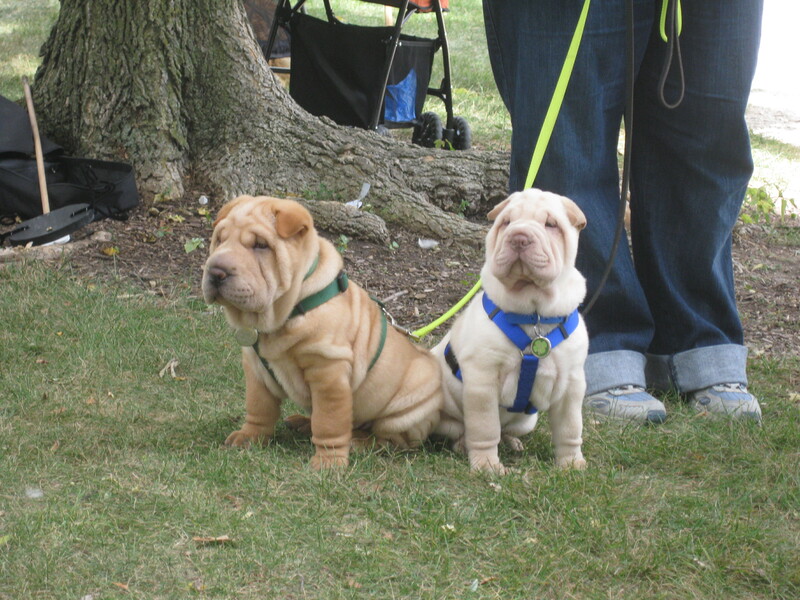 The photo thumbnail in this blogpost is of a couple of 9 month old Shar Pei puppies. I know these dogs have lots of health issues because of their very loose skin, but there is no denying the 'cuteness factor' that they bring to the table. Everyone was 'oohing and aahing' over them as they walked by. Click on the thumbnail (or visit our photo album) to see a larger version of the picture. Thank you to everyone who showed up today to say hello - we really enjoy seeing familiar faces, as well as making new friends and new contacts.